Incorporating: Pacific MotorYacht and Propeller Magazines: Powerboat readers now get much more – more than ever before. 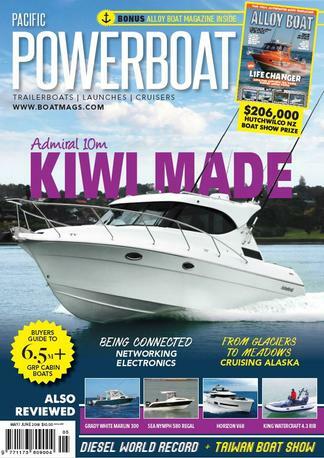 With the recent merge of industry leading publications Pacific MotorYacht and Propeller Magazine, the subscriber now has one magazine covering the entire powerboat market, be it a 4m-trailerboat or a 30m motor yacht.Pacific PowerBoat is totally and unequivocally dedicated to powerboating and everything associated with it – a bigger, better and more interesting magazine, that will be a win-win for readers and advertisers alike. The publication will remain as a bi-monthly and you will see from the first issue, boasting 180 pages, that it is a whole lot bigger than either Pacific MotorYacht or Propeller were as individual titles.So in effect whatever your interest, for no more cost the subscriber will get twice the size magazine with virtually the same amount of information and articles on trailerboats or motor yachts. No less for no more – it’s got to be a good deal !